My son lives quite a ways away from me, but this was one of his favorite gifts. Thank you mohottamobetta! Got this as a gift, they loved it. The product arrived right on time. My father absolutely loved his wonderful assortment of hot sauces. It is a great Christmas gift for someone who loves and appreciates the hotter things in life. 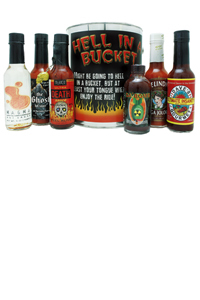 Great variety of sauces in a neat bucket! Each sauce has a distinct flavour and all of them are indeed hell. Although I have a good tolerance for heat, these sauces had me in tears.